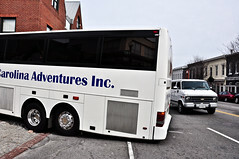 Congratulations to Carolina Adventures Inc, who learned the hard way today that you don’t turn your bus up Half Bank Street in Georgetown. No word on how quickly they’ll be able to get the bus unstuck, but you can bet this will snarl traffic through Georgetown for the rest of the day. Thanks a ton to Chris Rief who sent us these photos. Check out the alternate angle to see just how badly they’re screwed. Nice work, guys!